The simple reason being, if you are an end-user, it is not the time that matters, but what matters most is your need, the type of property you need to buy, size of property you need the location you prefer to stay in and most importantly, how much you can afford to pay for the property. 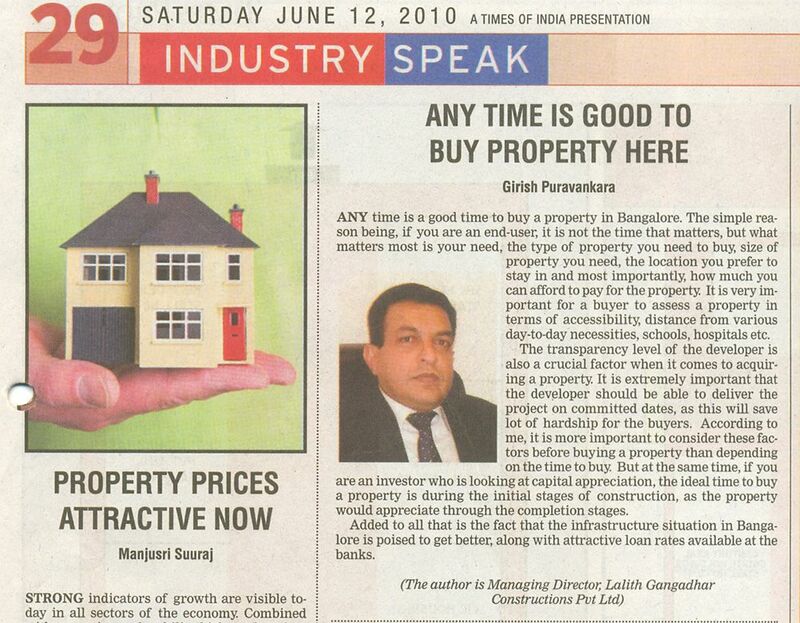 Any time is a good time to buy a property in Bangalore. The simple reason being, if you are an end-user, it is not the time that matters, but what matters most is your need, the type of property you need to buy, size of property you need, the location you prefer to stay in the most importantly, how much you can afford to pay the property. It is very important for a buyer to assess a property in terms of accessibilities, distance from various day-to-day necessities, schools, hospitals etc. 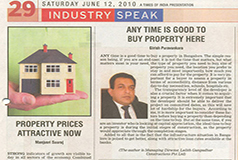 The transparency level of the developer is also a crucial factor when it comes to acquiring a property. It is extremely important that the developer should be able to deliver the project on committed dates, as this will save lot of hardship fir the buyers, According to me, it is important to consider these factors before buying a property than depending on the time to buy. But at the same time, if you are an investor who is looking at capital appreciation, the ideal time to buy a property is during the initial stages of construction, as the property would appreciate through the completion stages. Added to all that is the fact that the infrastructure situation in Bangalore is poised to get better, along with attractive loan rates available at the banks. In the trough of the recession period, the reality scene was forlorn with projects getting stalled, delayed and some projects didn’t take off at all. But LGCL raised the bar in the industry with projects that got rave reviews from their customers for high quality standards and transparent dealings. In the trough of the recession period, the reality scene was forlorn with projects getting installed, delayed and some projects didn’t take of at all. But Lalith Gangadhar Constructions Pvt Ltd (LGCL) promoted by Girish Puravankara raised the bar in the industry with projects that got rave reviews from their customers for his quality standards and transparent dealings. Sheer commitment and unflinching integrity – these two intrinsic values helped LGCL deliver whatever that had committed. All this in testing conditions when ever the established had taken a beating. “We launchd our first project Ashlar in 2009 when the market was totally down and dismal. But i say it with happiness that we have delivered our commitment on time. And we also have launched three new projects; Luminaire, Bamboo Forest And Beautiful World.” says Girish Puravanakara. Apart from that, a slew of new projects are poised for launched very soon on Hennur Road, Off Sarjapur Road, Yelahanka and J.P Nagar. If one closely inspects the LGCL success, few aspects become crystal clear. First, the commitment themselves with sincerity and integrity. “We were the first company to have a construction ESCROW account that made us totally accountability to our customers the impetus to invest in LGCL projects especially in a time when the overall market outlook was bleak” notes Girish. Second, LGCL was one of the few companies which had construction in full swing through the recession times. “We took some really tough decisions an maintained high standards of discipline that enabled our projects to go in full swing,” tells Girish. And finally, LGCL has worked hard to become a brand by itself. The villas by LGCL are now well known for their “world standard designs and quality”. Thus, sheer determination and excellence has made LGCL synonymous with exceptional quality villas. Ashalar – The stone charm of Ashlar evokes the old Bangalore. The sixty three villas off sarjapur Road is also the first that has kept up the promise of LGCL located near the Amrita Institute of Technology, Outer ring road and Wipro Campus. Ashlar is just a short drive from Kormangala. High end specifications, premium fixtures and accessories set these villas into a new league. 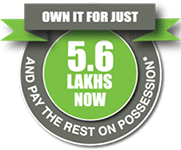 The villas are priced from Rs.2.5 Cr onwards. Luminaire – Villas in the heart of the city that speak of Arabian charm. Located in the neighbourhood of Indiranagar, in proximity to Hotel Leela Palace, this property is most coveted. There are seventy two villas that cost from Rs.2.35 Cr onwards. Bamboo Forest – With rustication architecture that will highlight the proximity to nature. The 32 villas of Bamboo Forest are located kust off Sarjapur Road in the vicinity of HSR Layout. With two types of villas on the offer, the price begins from Rs.1,37 cr Onwards. Beautiful World – Another premium project by LGCL the 29 villas of Beautiful World promises luxurious style. A mediterranean dream that is going to unfold in North Bangalore, LGCL promises to leave a blazing trail in main Hennur Road. The villas cost Rs.1.85 cr onwards. In this industry most promises are transient but LGCL proved that their words were cast of stone. As Girish puts it “In today’s market, customers repose their faith in us. No compromises, no hidden agenda – our customer get what we have promised nothing more nd more importantly nothing less”. When LGCL made the promise, it did everything that would honour their words even if things were, at times together that it seemed by their actions. LGCL only reinforced Girish’s words which was “i committed and I delivered”. A promise kept in good faith has been delivered by LGCL. The true hallmark of a winner.